I told you I would share some special guests. After one has been on board, a history course for 4 hours straight, there was nothing more refreshing for me than watching this young mother making her way through our tour with two small children Aurora, (2) and Astraea 71/2 months. By now I've missed my own grand kids, so I had fun catching a few shots of these little ones. I noticed the cute shoes...Of course, by now I want to go shopping...looking for children's outfits. Monica, the mother was most organized and relaxed...Take a look at how things were dangling from her back pack, teethers, soothers, bottles...You name it....she had them all. Ah ha, little Aurora caught me taking photos and she wasn't quite sure about this. Too be honest I wonder how much information she retained from this long day. After Astraea's nap, she was wide-eyed and bushy tailed. She kept our whole group entertained even our tour guide. What a cutey. Who wouldn't want to play photo shoots with these gals? But I need to share something humorous. Monica seemed most relaxed, until in St. Peter's Basilica, there became some tense moments. Because I had been tagging along, I moved in to inquire...well, Monica could not find her husband. I tell you, you don't want to loose anyone in this huge venue....I could see Monica pondering whether they would get back on the same bus? Would they make it to the cruise lines on time? Would he feel the needs of the 2 year old sitting in his backpack? It was quiet...we all started looking around. The tour guide used her cell phone trying to locate him. Just as we were to exit the building, there he stood, smiling, waiting for us. I saw one relieved Mother, and the rest of us all smiled and thought, "How many times have we been around those same bends?" He was just standing there waiting as if nothing had occurred. So now let us continue with the rest of the gang as we embark up on St. Peter's Basilica. In the distance you can see St. Peter's Basilica. The Vatican is an independent state of which the head of the state is the Pope. The Vatican City houses the government of the Roman Catholic Church and is surrounded by the city of Rome. The confines of the Vatican City total 108.7 acres. Population in 2007 was 783 people. St. Peter's Basilica ~ where he comes and addresses the huge audience.. 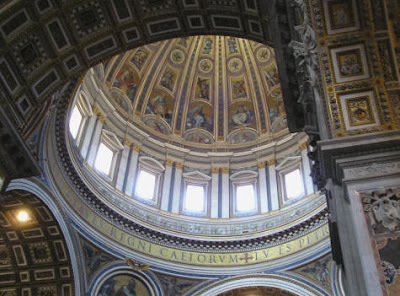 The dome of St. Peter's is huge ~ 42 meters in diameter. This was designed by Michelangelo. This magnificent dome rises to a height of 394'. As you travel through out Rome, one can see the dome towering into the skies. Surrounding the Piazza are 284 impressive Doric columns made of marble that were designed by another well-known artist, Bernini. People swarmed in line-ups to see this massive complex. Wait times can be lengthy. So while I waited I enjoyed capturing some photos of this and that. Actually we did not have to wait as long because we were with a guided tour excursion. A large pink granite obelisk can be admired in the center of the square. It was hewn from a single block and stands 25.31 m. high on a base 8.25 m. wide. Many great architects and artists made contributions to this beautiful Renaissance and Baroque building. Facing Saint Peters' square is Piazza San Peitro the most popular square in Rome that can hold up to 400,000 people. The square was designed by Bernini in the 17th hundred century. St. Peter's Cathedral is as impressive on the inside as it is on the outside. Lavish frescoes, golden artifacts and beautiful sculptures are just some of its many features. The Throne of St. Peter (Cathedra Petri) is a massive bronze sculpture created by Gianlorenzo Bernini between 1656 and 1666. It can be found at the front of St. Peter's Cathedral. A series of angels appear in a set of rays that stream up from the top of the sculpture. The bronze and gold altar that can be found in St. Peter's Cathedral in Rome is called the Baldachin Altar. Located directly above the tomb of St. Peter, the alter and canopy is a Gianlorenzo Bernini masterpiece that was built between 1624 and 1633. The Pieta by Michelangelo is maintained behind bullet-proof glass in St. Paul's Cathedral in Rome. This famous marble sculpture was built between 1499 and 1500. A pieta is a work of art that depicts Mary grieving over the body of Christ. 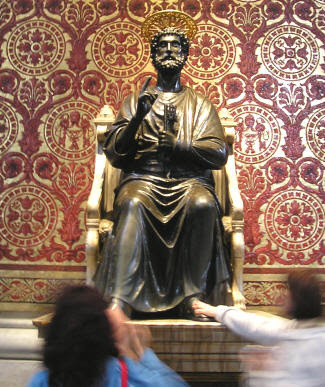 The "Foot of St. Peter" is a statue in St. Peters that was created by Arnofo di Cambio in the 13th century. For centuries, tens of thousands of pilgrims have come to the basilica and touched or kissed this beautiful sculpture. Unfortunately most of the foot is now worn off. We all smiled. This ends my formal tour of the Vatican. Rome is unique because of its many fine buildings that span so many centuries of history and it is richer in masterpieces, both architectural and artistic, than most any other city in the World. It's moments like this that make a final ending to a long historical tour. Thank-you Monica for allowing me to share these photos of your children and making my day most enjoyable. I think it's time for another Sea Day and then we're of to Livorno, Italy. Great tour once again, Marg...and so fun to some youngsters along for amusement. Thanks for sharing. Very interesting tour! I never realized that St Peter was purported to have been buried there. I wonder if I'll get to see Rome one day? When I do, I'll probably think about your blog! You could have been a history teacher! You've captured it so well . . . the architecture is unbelievable! Your tour of The Vatican brings back so many wonderful memories of my trip there with my daughter. But we didn't have adorable children to entertain us! Great tour Marg. . .it made the novel I read while camping come alive. So many places I've only read about. ..you've seen and documented. . .wonderful. I remember learning about The Pieta when I was about ten years old. I thought it was so beautiful, and I still do. It gives me chills. Thanks again Marg for writing such a wonderful entry. It's always nice to read about and see pictures of my family through another person's eyes. I had nearly forgotten about 'the incident' in the Vatican, as we later referred to it. I'm eager to read the rest of your entries - you captured the details of the day so perfectly, it was as though I was there once again.